The birthstone for Capricorn is the Garnet. The Zodiac sign of Capricorn also responds to Onyx, Ruby, Agate, Jet and Lapis Lazuli. The tradition of giving gifts of jewelry containing these stones dates back thousands of years. The gemstone, or birthstone Garnet is believed to conduct the energies of the planet Saturn with which it is sympathetic and that wearing jewelry containing the gemstone will focus the energies of the planet and sign through the gem. Capricorn people are practical achievers, and birthstones for Capricorn have been identified since antiquity. These Capricorn birthstones act as charm or lucky stone for Capricorn, mainly to support, as well as keep grounded, the ambitious nature of the zodiac sign. Do you know the different Capricorn gemstones? Here is a list of gemstones for Capricorn. Capricorn is a zodiac sign where the mystery of the darkest night and the glory of the light merge. The birthstone Garnet symbolises just that. The gem symbolises the crossing of the bridge of darkness before one can reach the radiation of the great white light. It is the conquest of the monster of the self that is the ultimate goal of the Capricorn. The deep Garnet is basically associated with the Kundalini fire or the primal fire of transformation. It is actually the integrating fire that assists the Kundalini up the spinal column. It is a stone of passion that sometimes need to be transformed into the power of purity. It is with purity of heart that the individual born under the Capricorn sign is able to realise God. In the temple of human body, the sacred spinal fire lies coiled like a snake and is called the "sacred stone". Garnet helps to awaken it and lifts it upward towards the head by the process of transmutation. Garnet effectively conducts the energies of the ruling planet Saturn that makes the wearer garner advantages from the sympathy of the planet on his life path. The sacred plexus is red, but when the fire is lifted towards the mid-section of the body, it functions under the blue ray. And when it nears the spiritual centre, it transforms into the purple violet ray. Garnet’s position as a birthstone for Capricorn is backed up by the fact that the gemstone is the birthstone in most ancient calendars for January, in which month Capricorn people are born. This Capricorn birthstone consists of a wide group of minerals that, while found in different colors, is most popularly known to be red. Red garnet is attributed with the power to enhance productivity, which is something that Capricorn people hold in high regard. Garnet enhances the positive qualities that are already present in the individual and primarily helps him by taking care of the relationship area. 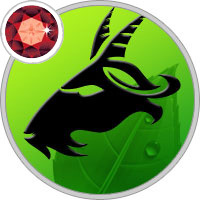 People are fond of taking advice from the Capricorn due to his radical nature and Garnet enhances this aspect even more so that the individual can take a good stock of the situation and behave in accordance to the relationship criteria. It makes them more approachable, faithful, true and pure. This gives them a good stead in their personal and professional lives thereby paving the way for success and peace in every sphere. The gemstone helps them to develop their insight and make them aware and committed, thereby regenerating lost emotions and relations. It also effectively removes negativity on approach. Garnet helps to boost and brings the transmission levels to normal if it is deficient in the wearer. It also works with the generative system and stimulates the sexual drive, especially the red Garnet. The gemstone aids in imagination and protects against depression and impure thoughts. The strength of the stone basically lies dormant until it is polished. Several variants of heart diseases. The Garnet can also effectively enhance both the sensuality and sexuality aspects thereby giving the wearer a more balanced life. The pink or violet shade of the Garnet works on the regeneration and transmutation. Garnets provide energy and courage to the individual but one needs to be careful and beware of the passionate love as it can well turn into hatred due to jealousy. Besides being identified as zodiac stone for Capricorn — both in Western and Hindu astrology — onyx is also the talismanic gemstone for Capricorn. Talismans are amulets or other pieces of jewelry believed to give their wearer magical powers. Capricorn talisman is engraved on onyx. This Capricorn birthstone is a banded variety of chalcedony, the name onyx mainly being applied to chalcedony of black and white bands. As a zodiac birthstone, the Capricorn stone is specifically identified to be the black onyx. Black onyx is a grounding stone, helpful not only to Capricorn, but to Leo as well, the two signs being the most ambitious of the zodiac. This Capricorn gemstone keeps the person grounded, giving him better control of himself as he goes about realizing his ambitions. Besides being specifically recognized as zodiac stone for Capricorn, ruby is the traditional birthstone for December in the Arabic, Hebrew, Italian, Roman, as well as the Ayurvedic or old Indian calendar. This Capricorn birthstone is the red variety of corundum, which in another color would be otherwise called sapphire. Ruby is believed to bestow peace of mind, courage and mental power. This Capricorn stone is indeed helpful to the ambitious Capricorn people in seeing them through in their endeavors. The Capricorn gemstone is also said to chase away impure thoughts and preserve chastity, helping to keep integrity in the potentially powerful Capricorn. While most closely associated with Gemini, agate is also a Capricorn birthstone. This Capricorn gemstone is the banded variety of chalcedony, which is the opaque to translucent variety of quartz. The banded Capricorn stone is believed to enhance prudence and caution, which to the responsible Capricorn are highly important. Beside onyx, jet is the birthstone for Capricorn in Vedic astrology. Jet is not really a stone, but fossilized trees formed under high pressure over millions of years. This Capricorn birthstone is black, and gave birth to the term jet black, meaning “as black as can be”. The Capricorn stone —like most, if not all, black stones — is a grounding stone, roughly as useful to Capricorn people as black onyx. Lapis lazuli is the stone associated with Saturn, the ruling planet of Capricorn, and is hence the planetary stone for Capricorn. This Capricorn birthstone is a relatively rare rock occurring in a bright blue color. Lapis lazuli is believed to stimulate a heightened state of awareness and expand perspective, and hence keeps the ambitious Capricorn objective and firmly grounded to reality. The birthstone for Capricorn is also thought to chase away negative emotions, including fear and jealousy, and enhance creativity.